Whether they’re revitalizing Brit punk tenets, or putting a fresh new spin on American rock standards, Sharp/Shock is no stranger to reinvention. The trio’s newest release, a cover of the Buzzcocks’ “Ever Fallen in Love (With Someone You Shouldn’t’ve),” showcases their no-holds-barred approach to power punk. 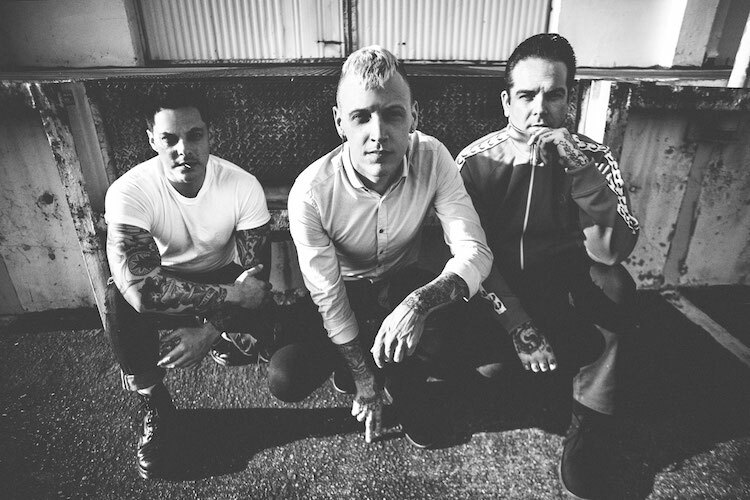 The excitement doesn’t end there, though—Sharp/Shock are kicking off their West Coast tour today, in support of pop-punk dynamos Alkaline Trio. Fronted by Davey Warsop (Beat Union, Suedehead) and Dan Smith (The Dear & Departed; world-renowned tattoo artist), Sharp/Shock brings two of punk’s most dynamic forces together on one stage. Along with choice cuts from Youth Club and their 2016 debut Unlearn Everything, Sharp/Shock will also be whipping out this Buzzcocks cover every night on the road. “Sharp/Shock” couldn’t be more of an accurate description of how this band came out of the gates and what they did with their explosive and refreshing first record Unlearn Everything. This power-punk trio that started as a purely casual project rapidly picked up speed with their unique and instantly memorable songs laced with nostalgia and angst. Singer/guitarist Davey Warsop (Beat Union, Suedehead) and bassist/vocalist Dan Smith (The Dear & Departed; world-renowned tattoo artist) are both UK exports but didn’t cross paths until they were both transplanted to California. Despite their dissimilar geographical beginnings, they quickly realized they were all very much from the same place.